« New Products, New Shops, Fall Sale & Stuff! It’s week 2 of our National Cookie Month celebration! 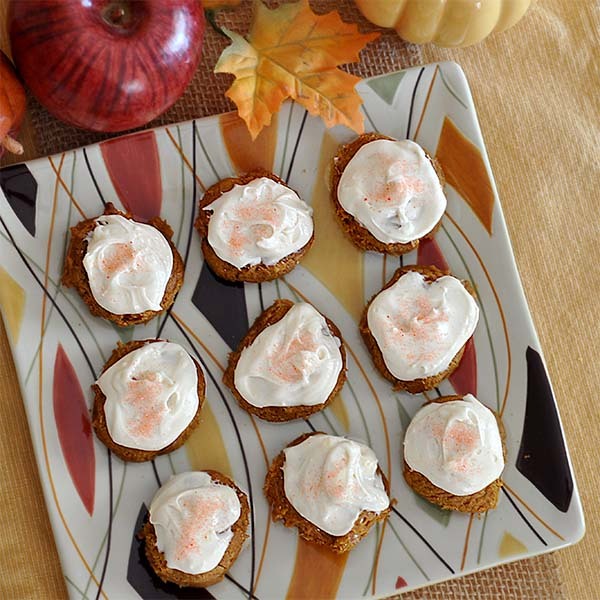 Today’s recipe is Pumpkin Cookies with Maple Cream Cheese Frosting. Hmmm…. that really sounds like the perfect autumn treat, doesn’t it? 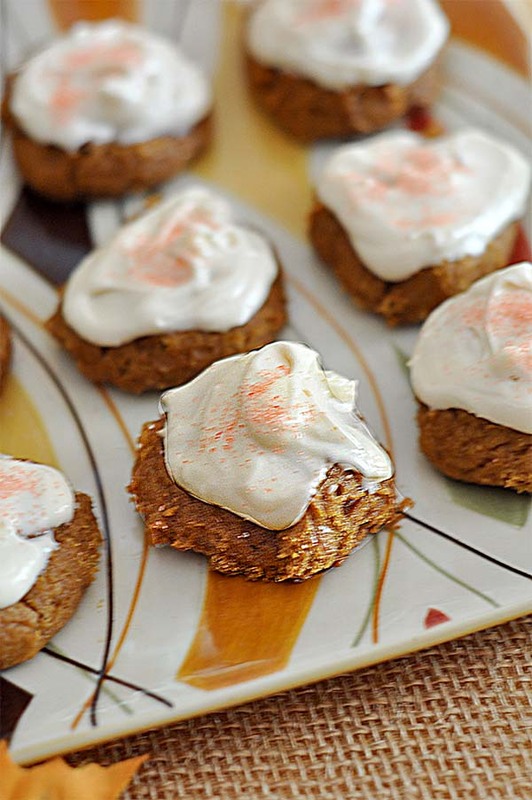 There has been a 2 ingredient pumpkin cookie recipe floating around the internet for a couple of years. I added one more ingredient- maple syrup- for some extra flavor. And, being a “more-is-more” kind of girl….. I decided they still needed something else…. like Maple Cream Cheese Frosting… yeah, that’s the ticket!! The cookies themselves are very cake-y and kind of sticky. The addition of the cream cheese frosting makes them phenomenal– they got rave reviews at a recent family dinner. Maybe the best part of these cookies, besides how easy and delicious they are, is how wonderful and comforting your house will smell while they are baking…. Better than one of those $25 jar candles! I recommend frosting them about 1 hour before serving, then place them in the refrigerator for the frosting to set until serving time. Sprinkle with colored sugar if desired. Preheat oven 350 degrees. Line baking sheets with parchment paper. Mix ingredients together in large bowl. Drop by rounded tablespoons, about 2 inches apart. Bake 15 minutes until cookies are set. Remove immediately to wire racks to cool. Store cookies in refrigerator. Beat all ingredients together until light and creamy. Try not to eat it with a spoon before it goes onto the cookies. This article was posted in Autumn, Desserts, Featured, Recipes & Food. Bookmark the permalink. Follow comments with the RSS feed for this post.Post a Comment or leave a trackback: Trackback URL. oh another one to try!! yum!! will let you know how this goes!! the s’mores turned out lovely!! I love to have pumpkin this time of year – and to combine with Maple Cream Cheese – sounds amazing!! I will have to try these out!! The cookies themselves were sort of boring- but the cream cheese frosting really takes them over the top :) My 7 year old nephew couldn’t get enough of them! I love pumpkin everything right now, and with only a few ingredients this recipe sounds like a winner. The ingredients are on my shopping list. Thanks for the recipe. Yes- it’s Pumpkin-Everything Season right now…. These cookies sound so delicious and I can’t imagine any easier recipe. Yes, I think pumpkin is a very American thing! And this time of year, you find pumpkin in everything- believe it or not, pumpkin flavored coffee is very popular! Trying not to use processed foods, like cake mix. Guess I can make my own spi9ce cake recipe and add the maple …… the frosting is made of real stuff, tho’.